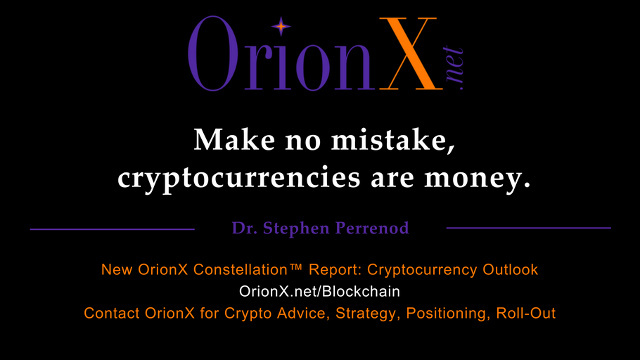 To learn more, read the press release below and view the paper in full at OrionX.com/Blockchain. Menlo Park, CA, April 2, 2018: OrionX, a Silicon Valley-based technology research, market execution, and customer engagement firm, today released a new research paper in its Constellation™ series. Written by OrionX partner, Dr. Stephen Perrenod, “Cryptocurrency Outlook: More Chasm Crossing” provides an in-depth view of the current cryptocurrency economy and an analysis of what might be expected in the next 9-15 months*. While many criticisms of Money 3.0 focus on technology issues like scaling, those issues are being addressed at a rapid pace. Detailed view of the top five crypto “coins,” including key metrics on how they have performed in the past as well as parameters that can impact the future. Predictions about how traditional institutions—banks and governments—may affect cryptocurrency markets in the coming months. Amazon and PayPal changed the way we spend money, now cryptocurrencies are changing the way it is created and distributed. Both the number of Ethereum addresses and the Ethereum market cap will exceed those for Bitcoin by the end of 2018. Increasing regulation of ICOs and exchanges will open the taps for Wall Street investment. The first unicorn ICO will occur this year. The era of Bitcoin forks is largely behind us. Dapps, decentralized apps, will blossom wildly. We will see multiple social media blockchain unicorns. Facebook could react by implementing its own token, in fact they would be remiss not to. Existing centralized exchanges will provide the facility for direct exchange from an individual’s wallet, mimicking the peer-to-peer experience of distributed exchanges. 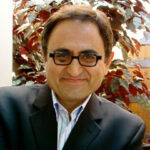 “Guided by its diverse technology clients, OrionX conducts research in advanced topics such as Internet of Things (IoT), Artificial Intelligence (AI), Blockchain/Cryptocurrencies, and Quantum Computing,” said Shahin Khan, founding partner at OrionX. The group’s technology foundation is in High Performance Computing (HPC), Data Center technologies, and Cloud Computing, which inform its general perspective. OrionX also announced that it will present at the Advanced Scale Forum 2018 conference to be held May 6-8, 2018 in Austin, Texas. OrionX founding partner, Shahin Khan will present “Blockchain, Crypotocurrencies, Smart Contracts – Technologies You Can’t Ignore” in collaboration with Ryan Quick, principal at Providentia Worldwide, an advanced technology consultancy. Mr. Quick previously led PayPal’s Advanced Technology Group. The session will cover the essence of blockchain technologies, focusing on their impacts to other key trends (such as IoT, AI, and quantum computing), identifying their realities and promises, and exploring why blockchain may or may not deliver. This talk follows Mr. Khan’s futuristic presentation (available from slideshare.com) on “Critical Technologies of the Future” at the HPC-AI Advisory Council conference held at Stanford University in Feb-2018. A video of the talk is available from InsideHPC.com. * This paper is an analysis of the technologies and trends surrounding blockchain and cryptocurrencies. It is not, and must not be considered as, financial, investment, or legal advice.